The 2012 Jaguar XKR-S Coupe has come fitted with many new and different features. 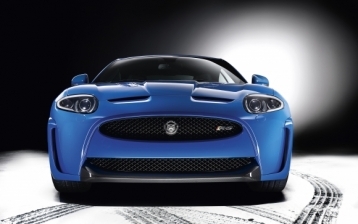 The exterior of the XKR-S can be one of 4 different exterior colors. It sits up on 20 inch painted alloy wheels that are fitted with performance tires. For the weather the XKR-S is equipped with a rear defogger and variable intermittent rains sensing wipers that will turn on automatically at any sign of moisture on the windshield. The interior comes in three different two-toned colors for an extravagant interior style. The front of the cabin houses sports style seats that are 16 way power seats with multilevel heating systems. These seats are wrapped in premium leather and are height adjustable as well. The front allows for 43.0 inches of leg room while the rear only allows for 27.6 inches of leg room, but also comes with a power rear seat easy entry system which makes it easier to get into the back seat. The XKR-S comes with remote power door locks, reverse tilt dual mirrors that tilt down so that you can see the curb when putting the car in reverse, power mirrors that have heating capabilities for those frosty mornings, and cruise control. Storage within the XKR-S consists of a front console with storage, front cup holders, front door pockets, and storage on the back of the front seats. Other features that are included are cruise control, power steering, a remote trunk release, 12V front power outlets, and front and rear parking sensors. You will also find an interior filtration system with a dual zone climate control, a trunk light, front reading lights, a leather heated steering wheels that has the controls on it for the transmission, cruise and audio, and the turn signals are in the mirrors. The XKR-S is also equipped with top of the line electronics as well. You will find that the XKR-S has a diversity antenna with 8 total Bower and Wilkins premium brand speakers. There is also an AM/FM radio with a 6 changer CD player. The XKR-S also has Sirius Satellite radio with a 7.1 discrete surround sound audio with a USB connection. Security and Safety for the XKR-S is like any other top of the line luxury vehicle. It comes standard with a 4 wheel drive antilock braking system, dual front with head protection chambers side mounted airbags with a passenger airbag deactivation sensor, child anchor seats, and a remote anti-theft security system. You will also find cornering lights, daytime running lights, and automatic turn on self-leveling headlamps for maximum visibility. The XKR-S comes with an emergency braking assist system, stability control, traction control, a pre-collision safety system, constant tire pressure monitoring and a pre-collision safety system for maximum driver and passenger safety.